Male/Female, 20 to 30 years old; Must possess at least a bachelor’s degree in Industrial/ Mechanical Technology or other technical courses; With experience in production or in any manufacturing company; Must be familiar in handling related mechanical tools and basic machine operations; Has good verbal and written communication skills; With experience related to tool and die maintenance is an advantage; Must be computer literate. Female, 21 to 28 years old; Must be a Registered Nurse, with updated PRC license; Preferably with two (2) years of experience as a Healthcare Practitioner/Company Nurse in a manufacturing company; With OHNAP certificate of training; Must be of good moral character; Must be computer literate; Willing to work on shifting schedule. Male/Female, at least 21 years old; Graduate of any 4-year courses; With purchasing know-how skills; Must be proficient in computer programs/applications. D & C TOOLS PHILS., INC. Female, 23 to 25 years old; Graduate of any 4-year courses; Preferably with relevant work experience. Female, 20 to 35 years old; At least college level; With at least 1 year experience in similar role; With knowledge in using POS machine; Has good interpersonal skills; With pleasing personality: Must be customer service-oriented; Willing to work on Sundays and holidays, and on shifting schedule. Male, 20 to 30 years old; At least college level; With at least 1 year of relevant experience; Has good interpersonal skills; Must be computer literate; Must be customer service-oriented; Willing to work on Sundays and holidays, and on shifting schedule. Male, 25 to 40 years old; At least 5’5” in height; At least college level; With at least 1 year experience in similar job; Must be trustworthy and customer service-oriented; Willing to work on Sundays and holidays, and on shifting schedule. Male, not more than 40 years old; At least 5’6” in height; With pleasing personality; Must possess a valid professional driver’s license; With experience in similar/related job is an advantage; Has excellent verbal and written communication skills; Must be knowledgeable of the technical and maintenance aspects of vehicle; With clear understanding of road signage/s, speed and driving standards; Has good driving records; Must be hardworking, self-motivated and a fast learner; Must be physically fit. Male/Female, not more than 30 years old; At least 5’5” in height for male and 5’2” for female; With pleasing personality; Graduate of BS in Hotel & Restaurant Management, Culinary Arts or Business Management, or at least college level with equivalent experience; Has excellent verbal and written English communication skills; Must be well-oriented in handling customer complaints and inquiries; Must be hardworking, self-motivated and a fast learner; Must be physically fit. Male, not more than 30 years old; At least 5’6” in height; With pleasing personality; Must possess a degree in relevant to Animal Sciences or Agriculture, or at least college level with equivalent experience preferably in a farm, zoo or pet shops; Has good verbal and written communication skills; Must be hardworking, self-motivated and a fast learner; Must be physically fit. 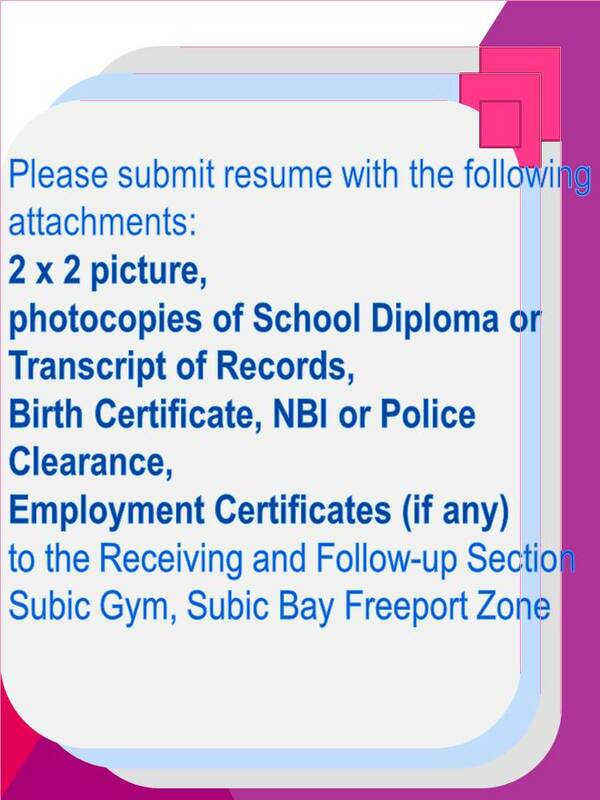 Male/Female, not more than 30 years old; At least 5’5” in height for male and 5’2” for female; With pleasing personality; Graduate of BS in Management/ Tourism/ Mass Communication or any vocational courses; With relevant experience is desirable; Has excellent verbal and written English communication skills; Must be well-oriented in handling customer complaints and inquiries; Must be hardworking, self-motivated and a fast learner; Must be physically fit. Male, not more than 30 years old; At least 5’6” in height; With pleasing personality; Graduate of at least any vocational course; Has good verbal and written English communication skills; With technical knowledge specially in computers, printers and cameras; Must be hardworking, self-motivated and a fast learner; Must be physically fit. BUCHEL CONSULTANCY LOGISTICS SERVICES CORP. Candidate must possess a degree in Secondary Education or other relevant collegiate/bachelor’s courses; Must be 18 years old and above; With at least 2 years of administrative experience; With knowledge in logistics is an advantage; Must be fluent in verbal and written English; With basic accounting skills; Preferably with strong verbal Australian-English skills; Must be highly computer literate; Has good interpersonal skills; Must be hardworking, highly organized, trustworthy and flexible; Must be willing to work on Australian time, from 5:00am to 3:00pm. Male/Female; Must be a Registered Nurse; At least 5’3” in height; With experience is desirable. Male/Female; At least 5’3” in height; Graduate of any business courses; With experience in similar role is desirable. Male; At least 5’4” in height; With experience in similar role is desirable. Male; At least high school graduate; With at least 1 year experience in similar job; With knowledge in building repair and maintenance. Female, at least 20 years old; At least 5’3” in height; Must be a graduate of BS in Hotel & Restaurant Management/ Hospitality Management or Tourism Management; With at least 1 year experience working in a fast food, hotel or catering industry. Male, 18 to 30 years old; At least 2nd year college level or a holder of an associate degree in Hotel & Restaurant Management. Female, at least 20 years old; Must be a graduate of BS in Accountancy or Accounting Technology; With or without experience.